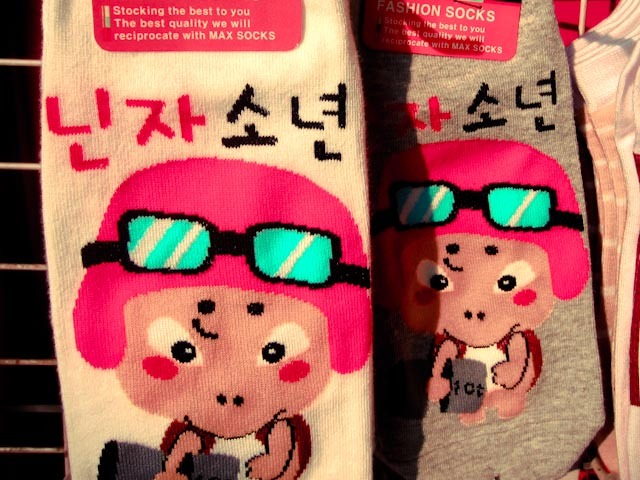 Here expatkerri has gathered for you the ten oddest and most interesting gifts to give as souvenirs from South Korea. We guarantee all of these gifts will be good conversation starters. 1. 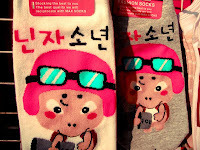 CRAZY SOCKS - Ramyun noodles, swear words, K-pop stars, bunnies with fuzzy ears, drunk cartoons, poetry, soju bottles... the possibilities are nearly endless with these socks. Best of all they are available everywhere and are usually only 1000 won for a pair. 2. 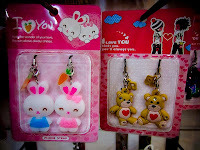 COUPLE PHONE CHARMS - For couples, nothing is more Korean than matching everything. 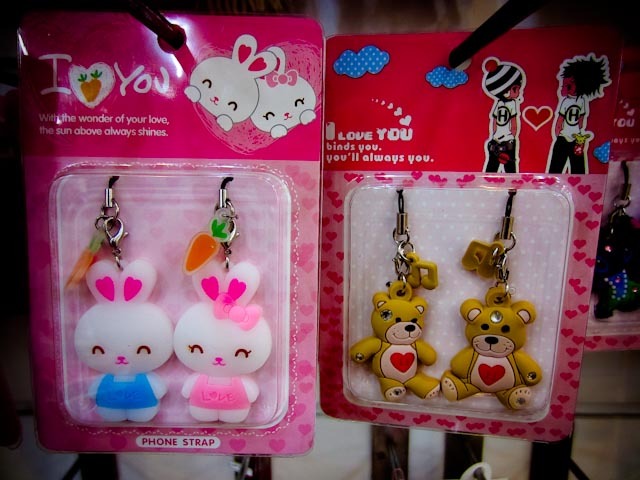 You can go all out and buy matching couple t-shirts, but it's cheaper to buy your friends in relationships couple cell phone charms. 3. DRIED SQUID - A very popular snack during festivals and at the movies, the potent squid is usually sold with dipping sauce. 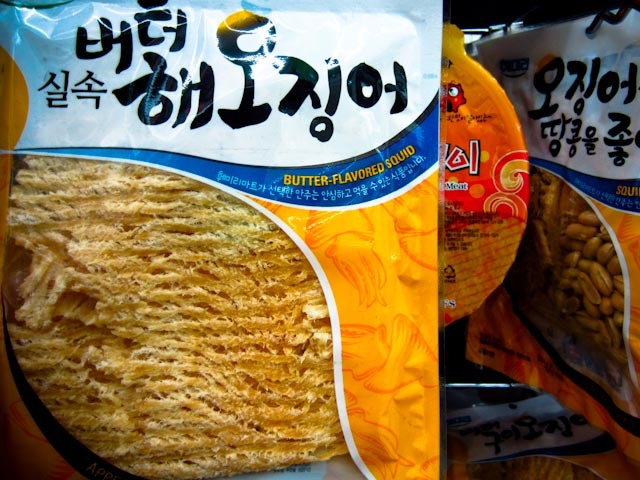 You can buy it in most food marts for under 2000 won. Make sure you instruct your friends to bring the squid in their bags next time they go to the movies. 4. SCRUBBING CLOTHS - Since your friends aren't in Korea to experience the full extent of the Korean sauna, give them a little taste of it by giving them a scrubby cloth. 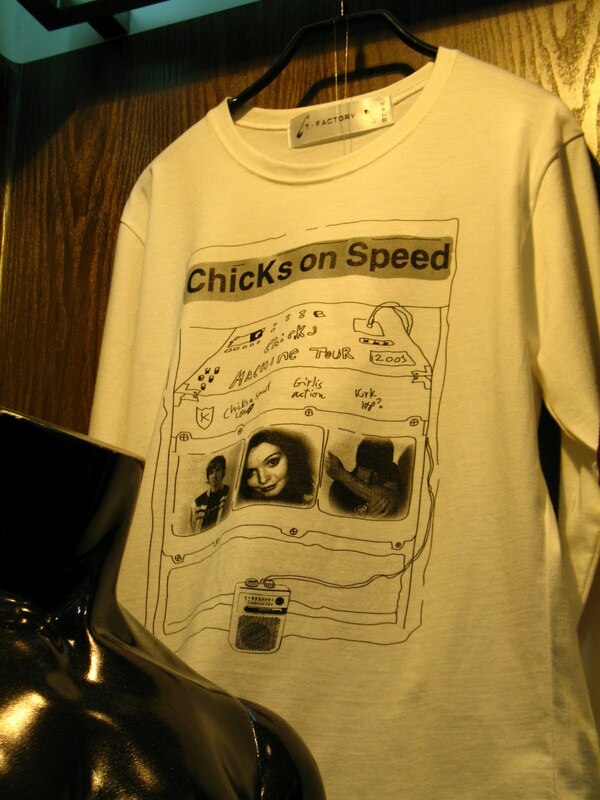 The cloths are available everywhere and cost just 500 won. Make sure you instruct your friend to scrub their skin to the point where the dead skin comes off like eraser bits. 5. PACKAGED KIMCHI - "The World's Healthiest Food". The fried kimchi tastes best, and it's packaged so you can throw it in your bag without making all your luggage smell like fermented cabbage. Remember to say "kimchi" when having your photo taken too. 6. 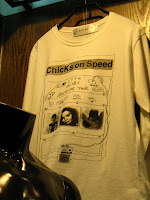 CRAZY ENGLISH T-SHIRTS - Anything goes when you're shopping for t-shirts in Korea. Browse among the mildly offensive to the completely indecipherable. 7. 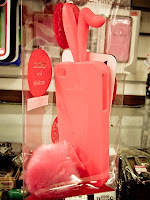 IPHONE BUNNY CASE - If there was an award for putting cuteness over all else including functionality, Korean girls would win first prize hands down. These absurd phone cases nearly double the width of the phone, conspicuously showing off the fact that your phone is cuter than everyone else's. Who wouldn't want to share that glory with their friends back home? 8. 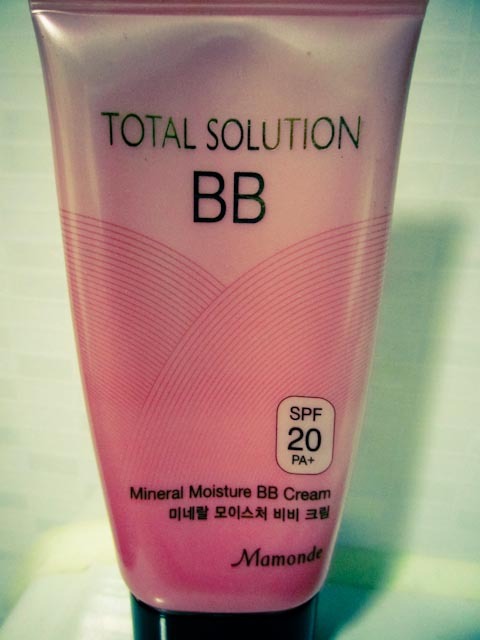 BB CREAM - For the women on your list, why not buy them a tube of "the Korean beauty secret". It is both a moisturizer and a liquid foundation, and as such it is supposed to save time in the morning. Plus it is meant to prevent wrinkles and help clear up breakouts. Win win! 9. ANIMAL HATS - Though they might look like they're made for children, motorcycle-riding delivery men also wear these ridiculous hats. I've never seen them in any other country. 10. METAL CHOPSTICKS - To my knowledge, Korea is the only country in all of Asia to use metal chopsticks. They're reusable, sterile, and hard to get used to at first. Buy some for your friends and have a contest using the chopsticks to pick up M&Ms. I was so surprised when I saw the animal hats at the mall (in the US). I'm not sure if they had adult sizes though. Animal hats were a huge craze in China when I lived there a few years ago too! 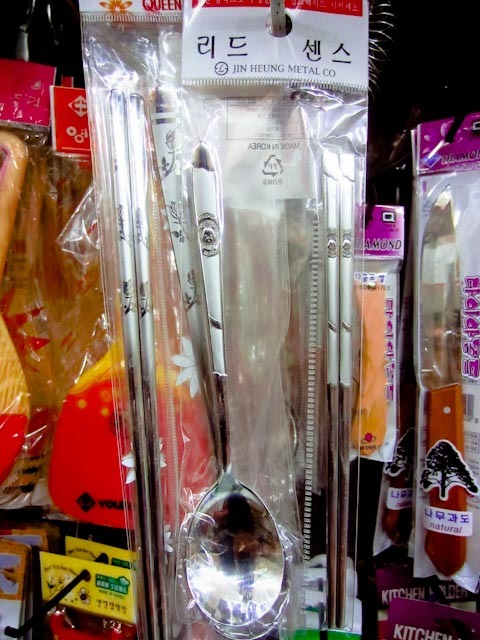 yes, i tried to pick items that are commonplace in Korea. i'm glad you enjoyed my list! Thanks for featuring my FU socks! I have a lion animal hat. 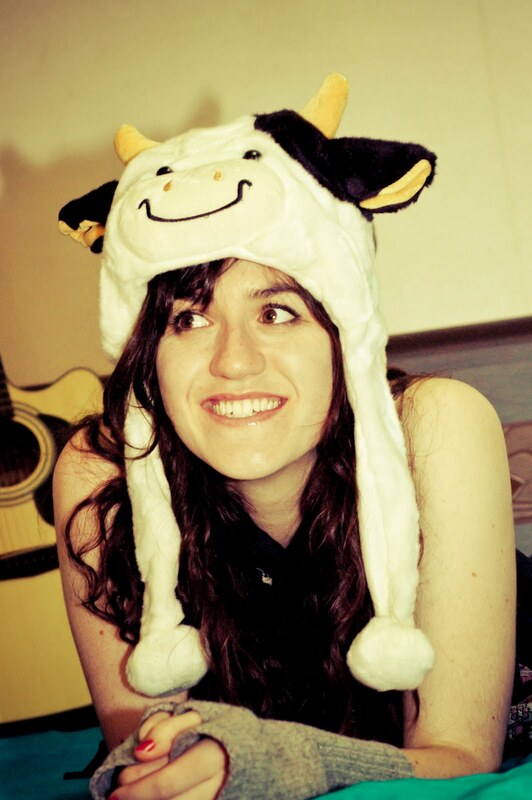 The animal hats got popular for adults this last year in the U.S.
i had no idea you had a blog! i'm adding it to my blog-roll. and i want one of those animal hats!!! I bought myself metal chopsticks here in the U.S. so I can practice before I go to Korea. thankss! 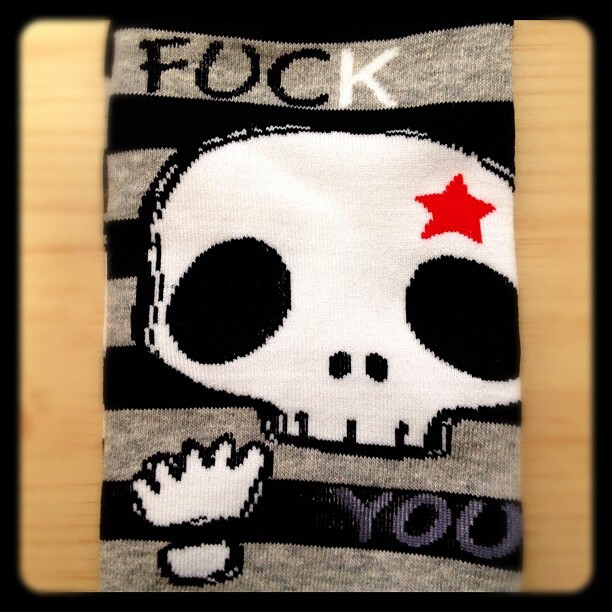 Now I have an idea what to buy for my friends, and also what to buy for myself hahaha! I just came home with too many pairs of cute socks, too much make-up and nail polish, a phone case that looks like a purple penguin, chopsticks pilfered from a restaurant by my friend and two bottles of soju. Thinking I need to get the boy to throw in one of those scrubby towels when he sends a box of his stuff home to Canada next month.